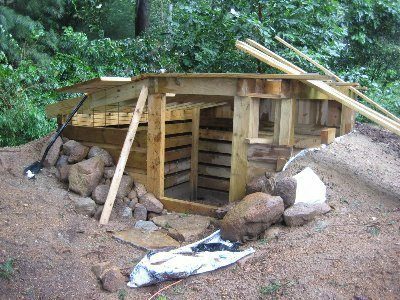 I've been intrigued by colonial era bank houses and Anasazi pit houses for years, and I figured this was as good an excuse as any to build one. 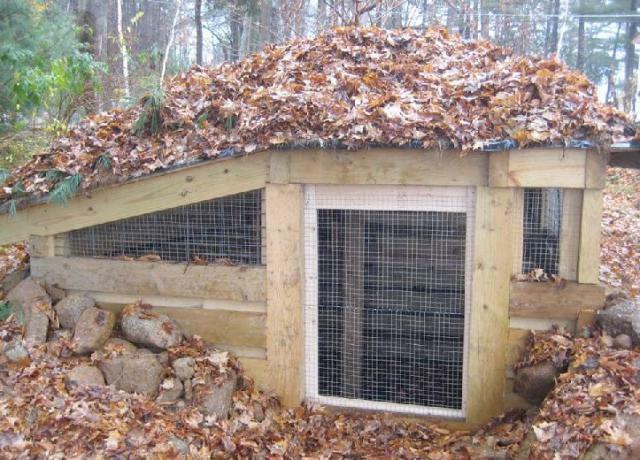 Hopefully an earth-sheltered, sod-roofed coop will be warmer in winter and cooler in summer than our conventional one, and muffle the rooster's crowing for our neighbors. Even though my long-suffering wife is accustomed to my eccentricities, she was mildly appalled when she saw the hole in our yard. After three days with a pick and shovel this is what I had accomplished. A neighbor with a little backhoe took pity when he saw the blisters on my tender pink hands and speeded things up. 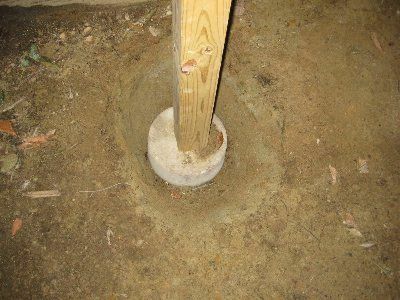 Now I have a ten-foot by twelve-foot hole. There's still a tremendous amount of dirt to move to level and square it, hope I can get it done before the ground freezes. 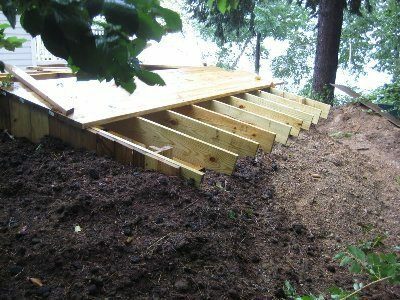 My tentative plan is too leave the floor dirt, and use pressure-treated 4"x8" timbers to build up the sides, notched log-cabin style to resist the pressure of backfilling. 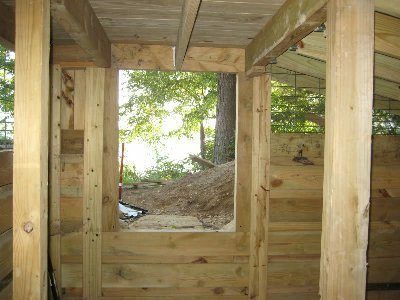 I'll put a gently sloping sod roof over it, and a window in the south-facing door. It's become a neighborhood project - I bribed them with a boat ride to the pizza parlor. 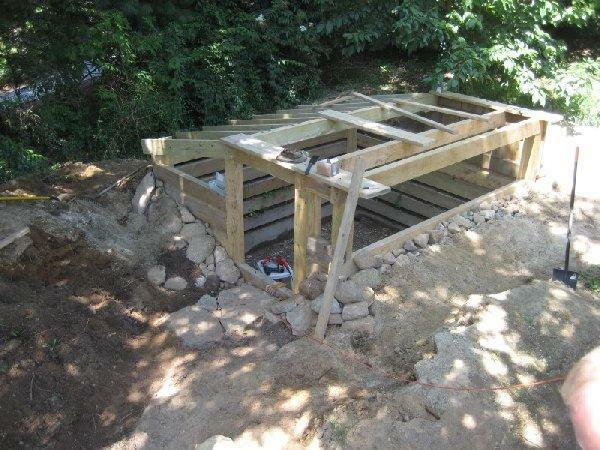 What's now become locally known as "The Chicken Hole" is progressing slowly. This may become a race with freezing weather. Inside dimensions are about 10' x 11'. 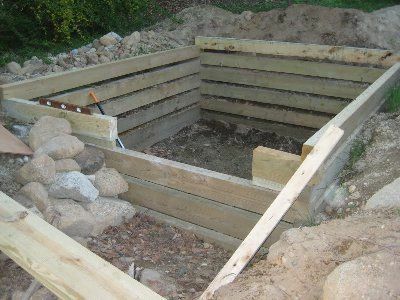 After delays attributable to winter freezing, spring rains, economic shortfalls, and a period of contemplative conceptualization that my wife mistakenly characterizes as laziness, WORK ON THE "CHICKEN HOLE" HAS RESUMED! I'm about ready to start planking the roof. I've got 4 x 8's spanning about 11 feet between walls, and the longest gap between them is 40". 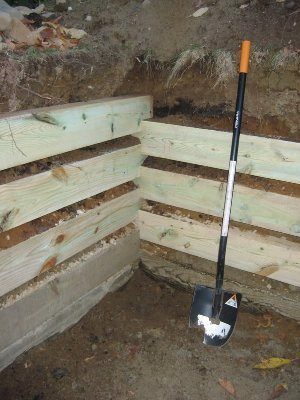 I'm going to use pressure-treated 2x lumber for decking, then cover that with a couple layers of thick black plastic and about 6-8 inches of soil. I have a feeling I'll have to use a screw post or two under the beams to prevent sagging, but we'll see. Finally nearing completion. Still need to put more dirt on the roof, a deep layer of leaves on the floor, cover two of the openings with chicken wire, and build a door. Lin & Hailey, EquiSally and FortWorthFlyer like this. 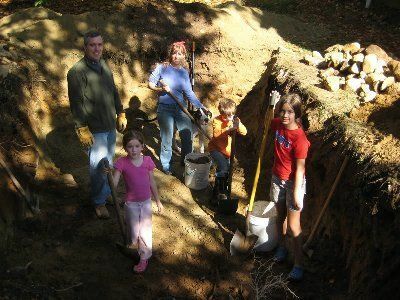 This would be a great coop out here in Aussie, coze of the cool coming from being underground! Excellent job! Any new updates? I love this! I want one i doubt my husband will do it through we have lots of clay and giant rocks that make fencing a pain. On good days even the auger has problems we have to let water sit in a hole over night and even then it doesnt always work !! Thank you for the great idea! 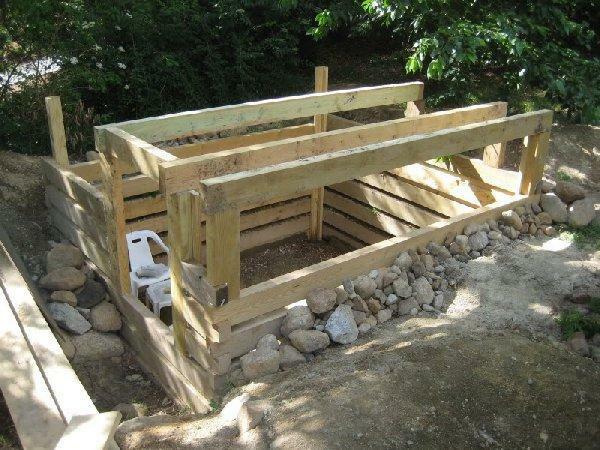 My husband says he likes digging holes and I could build the chicken coop I designed.......I may throw him this idea and see where it goes! Very good chance it turned into an underground lake when the rain came - hence no update. 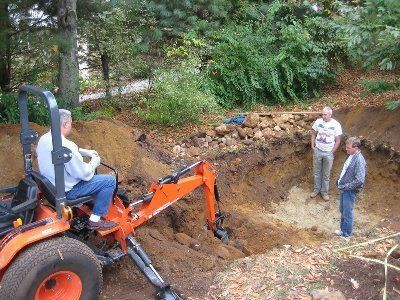 I was astonished at the contstruction, and it appears to be perfect for a root cellar as long as drainage is accounted for in the perimeter of the structure. I also feel this person may have used the leftovers for a log cabin kit. 4x8 posts are tough to come by here unless log cabin kit. This looks great! How has it been working out for you? I just saw this. I know its 5 years later, but I just wanted an update. Is it still being used? did you have to modify it any? I just LOVED reading this! Witty and well written, with such a cool coop concept. I'm not sure we could do something like this here in the Pacific Northwest... so much rain! But, I bet it would be perfect for someone in more arid situations. Another reason I don't think work (aside from the fact that my sweetie would tell me to go kick rocks if I drew up plans like these- I also suffer from "contemplative conceptualization") is that here in Portland, OR, we have a pretty serious rat problem... Being a port town, the rats are everywhere, especially in all the century-old cracked sewer lines. We'd have to swaddle the whole thing in hardware cloth, and THEN set it in the ground. 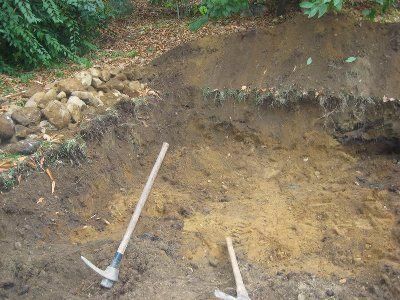 Have you had any problems with digging predators? Beautiful job, great idea, how do you keep rain runoff OUT? That is AWESOME!!! I too am curious how it's holding up. 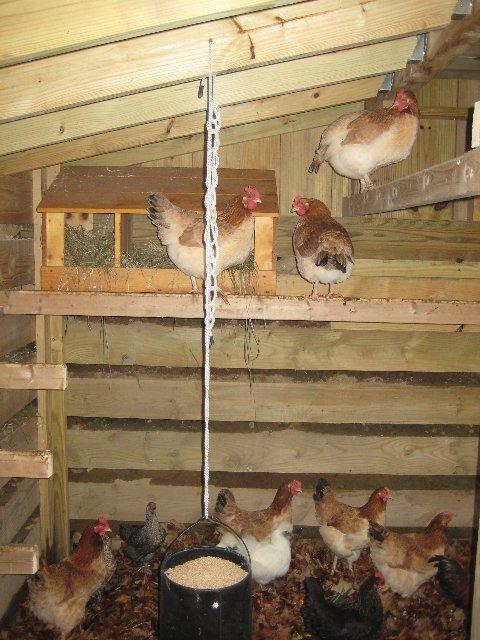 I'm betting it would be great to have around here to help the girls "beat the heat" in the summertime. I would love to build something like this. With a hobbit door of course. What breed are those beautiful girls with the darker wings and peachy colored bodies?? If I didn't live on a marsh I'd take your idea and run with it! Wonderful coop!! Very nice! Could not find any updates on the themp inside. How is it? I love the earth berm houses! Cool coop! OH MY GOSH!!!! WOW! That is AWESOME! Looks very nice too! "she was mildly appalled when she saw the hole in our yard." That is so cool!!! I love the design and want to build one for my girls! Cool concept. I didn't see a response in reference to moisture and drainage situations. What about cleaning? I can see this concept used in hilly/sloped areas where the 'run off/out' could be uilized as grey water for garden usage. wow, i want to build something like that! amazing idea!! like the underground homes and that one in a cave. very cost effective! I think all the coops are great but yours is my favorite!! 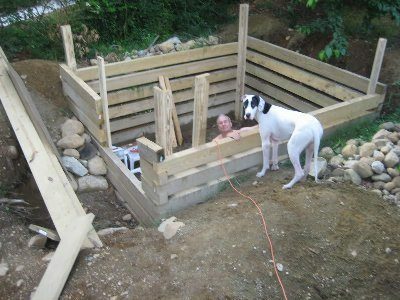 I plan to build an underground house and barn for my critters if I can ever sell the place I'm in. 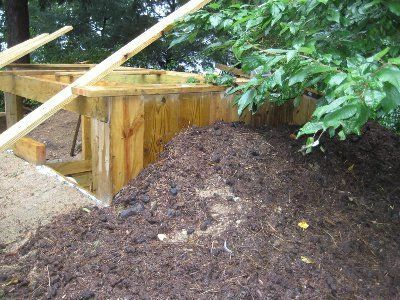 Anyway wondering how this coop is holding up and if you had any moisture problems, or leaking .Great Job on the coop too.......awesome!!!!!! Wow, very interesting coop. I like the look a lot. How is it working out?